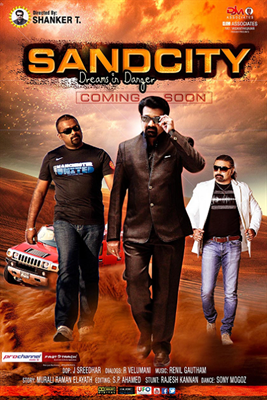 Sand City malayalam movie directed by Shankar starring Prajin Padmanabhan, Gautham Krishna, Thanishka and Varuna Shetty in lead is ready for release. Scripted and produced by M.I.Vasanthkumar, the movie is simultaneously made in Tamil language as Manal Naharam. Vinod Kumar (VK) Jaise Jose, Jijesh Menon and Shankar have also given life to other prominent characters in the movie. After the final cut, the movie will reach the theatres very soon. Shankar, who made his debut in acting with 'Manjil Virinja Pookkal' is gearing up to reach his next directorial venture in theatres. The movie titled 'Sand City' scripted by Murali Raman and produced by M I Vasanthakumar explores the lives and dilemmas experienced by people from India at Arab countries. Leaving their kith and kin at home, the people reached gulf with better dream and fortunes. The story is being completely shot at Dubai. The 50-day shooting of the movie which also deals with romance and friendship was very tough and challenging. The movie is simultaneously made in Tamil language as 'Manal Naharam'. The actors were selected through a talent hunt which gave an opportunity for few youngsters to show their aptitude in acting before the camera. Gautham Krishna, who had done the lead role in 'Yakshiyum Njanum' and 'Prajin Padmanabhan', the hero in 'Thee Kulikkum Pachchai Maram' were selected after auditions to do the main characters. Thanishka and Varuna Shetty are the heroines while Vinod Kumar (VK) Jaise Jose, Jijesh Menon, Dubai Kannan, Rex George, Caravan Arunachalam, Saravan, Master Ashwanth, Saakshi Sharma and Shankar himself will give life to other prominent characters in the movie. The tunes are being set by Renil Gowtham. The audio release of Sand City was held on 15th October 2014 at The Oberoi in Dubai which was attended by the entire cast and crew of movie and invited guests. This romantic drama is set against the backdrop of some iconic locations around the UAE, including Dubai, Ajman, Masafi, Dibba, and Jebel Hafeet. Shankar, being credited with 225 movies in his name had a good time in Tamil during the 1980's. Varuna Shetty, a resident of Dubai has also done a pivot role in Mohanlal starrer 'Rasam'. The movie would be a new experience for the moviegoers. After the final cut, 'Sand City' will reach theatres in November 2014.